Surbiton Yatai is a 5 metre tall, four wheeled timber structure, weighing nearly two tonnes. It has been designed to be pulled by the community at the annual Seething Festival to signal the start and the end of the street parade. The Yatai incorporates 420 recycled milk bottles on its outer cladding, creating pockets for displaying wild flowers and herbs. 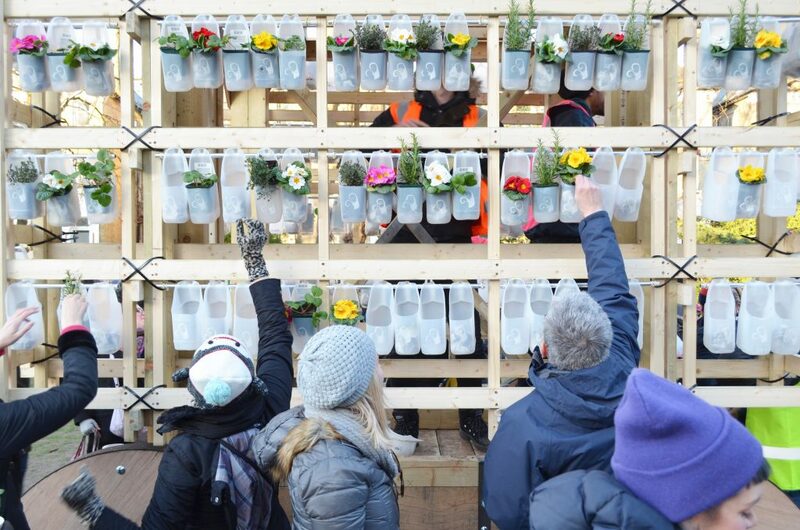 It acts as a mobile seed bank, promoting the idea of sustainable growth. The project strengthens links between the University and the Surbiton community. The prefabricated panelised structure can be assembled very quickly. The Yatai will be rebuilt again on 2nd June 2018 to coincide with the Kingston School of Art end of year show, and launch at our Summer Garden Party on 2 June 2018. 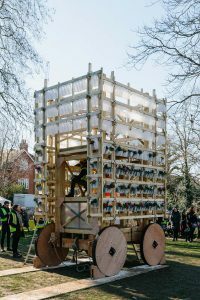 It will be exhibited throughout the summer as during the museum opening part of the annual London Festival of Architecture, and will appear each year at the Seething Festival.